What are recommended server requirements? * – With more than 20000 clients you will need to consider to decrease Client Poll frequency or clustering your DA servers. Can I export users from our Active Directory? Yes, DeskAlerts fully supports Active Directory, you can export users. DeskAlerts synchronizes with Active Directory continuously. You can export multi-domain or very complicated tree structure. For DeskAlerts v9.1 clients, .NET Framework 4.6.2 and Visual C++ Redistributable packages (2013) should be installed on Windows workstations. Where DeskAlerts is hosted, on our side or your side? You can obtain full copy of DeskAlerts and host it within your corporate network or any other host (including cloud). Is dedicated server required or DeskAlerts can share the server? DeskAlerts can be installed on server sharing resources with another applications. I’m having issues setting up a database during the install process. Usually we recommend to create a service account in AD with the dbo rights for DeskAlerts database and run the server installation using this account (in this case, you should just check “use Windows authentication”). If you’re feeling better working with SQL accounts – it’s perfectly fine, just create a service account there with the same scope of rights (dbo for DeskAlerts db). I am getting “Your server is configured to run in Active Directory mode. This client doesn’t support it or you have old version of the client.” message. It’s possible that your machine isn’t in Active Directory domain. By default, DeskAlerts with Active Directory support doesn’t send messages to the outside of domain. You can change this behavior by logging into DeskAlerts Control Panel with administrator rights, going to the Settings -> Common Settings and check “Mixed authentication” under the “Active Directory” section. I get the “Cannot Start Website” error. Make sure that you have the administrative rights to the server, as this issue might be attributed to the lack of rights to change IIS settings. Furthermore, please make sure that you don’t have any software that might be using the TCP port on the machine. I accidentally went over the number of active license I can have at the time. What can I do? You need to apply a specific unlock patch to force licenses re-calculation. Send us an e-mail to support@deskalerts.com regarding this issue and we will send it to you. Apply it on a server and restart IIS. It should force the licensing library to re-calculate the active users. How can I uninstall the desktop client if I select the option to hide the tray icon when creating the installer? You can remove the client using usual Windows “Add or Remove programs” utility, if you haven’t disabled this option during the client building. If you did, try running “uninst.exe” file located in DeskAlerts application folder (in program files). Why is it our active user are always changing? And what’s the meaning of active user are they the online users or all users? 1. He has a desktop client application installed and was online at least one in the past 24 hrs. 2. He has received some emails sent from DeskAlerts system in the past 24 hrs. The counter itself is being refreshed every hour. How to configure an SMS channel that will send text alerts? We always try to make communication of clients more effective, for this reason, we have a module for sending text messages through different SMS gateways. Because many SMS providers use unique API, we can't warranty correct work with everyone, but we ready to help you with configuration. You can see examples here. I have an issue sending SMS using DeskAlerts. Try removing all the special characters from the number you are using to send the SMS. Furthermore, you might want to check your SMS gateway service account dashboard – most likely, they have a log of API requests here with the exact reasons why messages may not be coming through. I want to set the default for Set Alerts:Lifetime to 1 Hour but it keeps defaulting back to 1 Day. Can I send alerts from another application? Yes, using API another application can send alerts via DeskAlerts, please ask sales. Each client consumes about 100Kb per hour in an idle mode. You can adjust this value by setting pool period. Yes, Desktop Client can be packaged as MSI file. What is port number DeskAlerts use to send messages? DeskAlerts uses 80 HTTP port and 443 HTTPS (can be changed). Can I hide uninstall, close icons from DeskAlerts Client menu? I’ve got HTTP 500 error when tried to upload a file. This issue may be caused by the current IIS settings being too small for the intended file uploads or downloads. You can change the size limit by editing the IIS metabase.xml file. Please check our Administrator’s manual, Troubleshooting section. Is DeskAlerts able to run on 64-bit, or does it only have 32-bit capabilities? Yes, DeskAlerts supports both 32 and 64-bit. Can SQL instance share a server with other databases or does it need to be it’s own separate database? Yes, you can share it with other databases. We’ve purchased the skin service, how can we change notifications skins? Skin Service is done on our side. Send the graphic mock-up of desired alert appearance to your contact person in DeskAlerts and you will get the update shortly. Our users are receiving messages that are already not relevant, how can we prevent this? Always specify the Lifetime parameter if you’re sending the alert without schedule, or the correct End Date if you’re using scheduling pattern. What parameters of alert should be checked so it will appear on the screen of locked workstation? 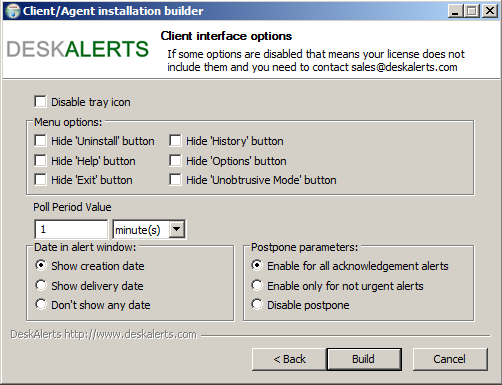 The alert should be Urgent and the DeskAlerts client on this workstation should be configured to receive locked screen alerts. We’re planning to upgrade the DeskAlerts client applications, should we remove the existing versions first? In most cases, new DeskAlerts clients within one software generation (4.x.x.x, 5.x.x.x, 6.x.x.x, 7.x.x.x, 8.x.x.x, 9.x.x.x,) can be installed over the previous ones. If you’re upgrading from one generation to another, you should consider the uninstall of previous versions. We’re planning to upgrade the DeskAlerts server, will the old clients receive alerts? If the generations of Server and Client software are the same (version number begins with the same digit), clients will receive alerts though some newest features may not work. If the generation gap is too big, outdated clients will receive error messages prompting users to upgrade the clients. I have installed an update on the server, but nothing seem to be changed. How to make a non-domain users receive alerts when the client is intended to work in Active Directory mode? There is an option for this in System Configuration, under Active Directory settings. Is it possible to move the alert behind the other windows to read it later? No, alerts are always displayed on top of other windows. You can re-view closed alert from the client History. Sending a message by Broadcast will send the message to ANY user/group/computer/ou instance in the sender’s audience. Some interface elements of Control Panel are unresponsive or missing at all, what can I do? You can read it from documentation page. Have not find the answer for your question? Ask us!